Happy Wednesday! I've been busy lately enjoying the last few weeks of summer with my girls and planning Claire's birthday party! I can't believe she's almost 6! Today I'm showing you a little bit more of my dining room/ sewing room makeover. This was originally the dining room when we moved in but I took it over as my office/sewing room since that's mostly what I use it for. I decided to make it look a little more like a dining room and less like a fabric store that's been hit by a tornado. I painted the walls himalayan trek by Benjamin Moore. You can read more about that in this post. 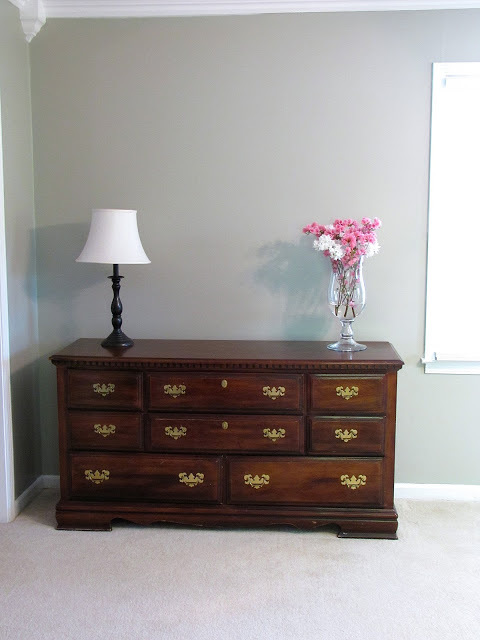 And here is what the dresser looked like before I painted it. When we first got married a sweet couple gave us some bedroom furniture and this came from that set. And here it is as of today. 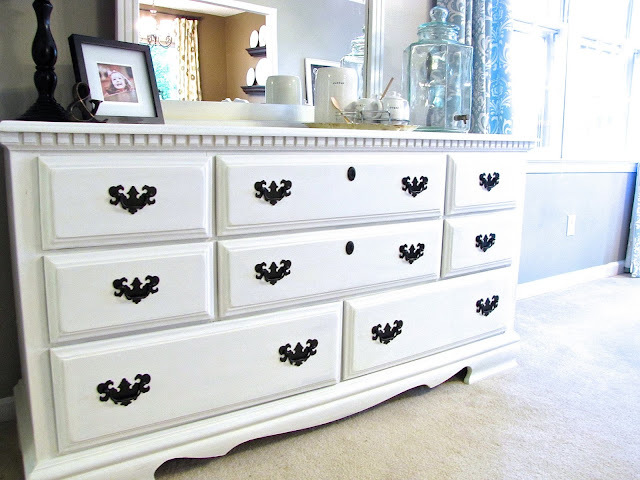 I decided to paint it using Ann Sloan chalk paint in pure white. You can read about her paint here. And go here to find a retailer near you. It was so easy as there was no prep work except for cleaning. I got it finished one morning while the kids were with Grammy and I waxed it a few days later in the evening and it was done! 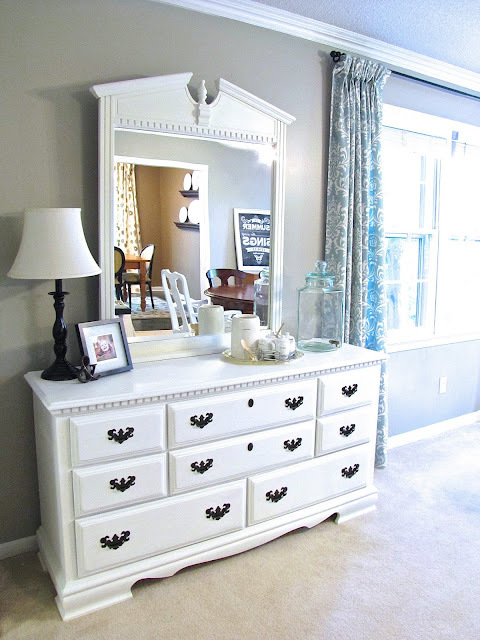 I decided to paint the mirror that went with it and put it back on the dresser. For the time being it will stay but I may change that up a little in the future. To save money I just spray painted the existing hardware with oil rubbed bronze spray paint but I may get something different in the future. 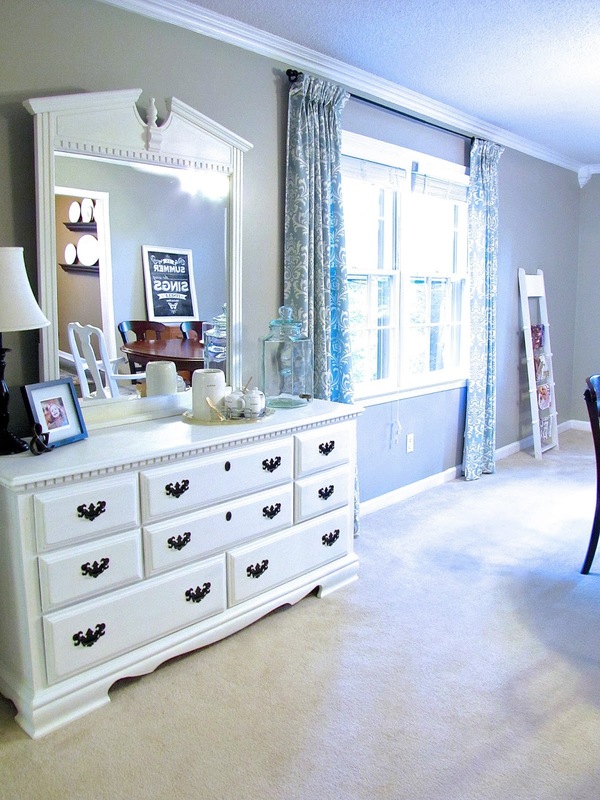 And here you can see a little peak at the window treatments I made for this room. I'll try and take better pictures of those to show you. We moved the oval table from the breakfast room in here as you can kind of tell from the reflection in the mirror. I still use this room as my sewing room. It's big enough that when I need to work on a project I just move the dining table to the side and get out my folding craft tables and get to work! Linking up with Ella Claire.